Our third new Shrub Bundle is the Privacy Bundle, with each shrub chosen to create privacy in your yard, while giving you a beautiful backdrop of biodiversity. All shrubs in the bundle do well in either full or part sun, and in sand, loam, or light clay soils. 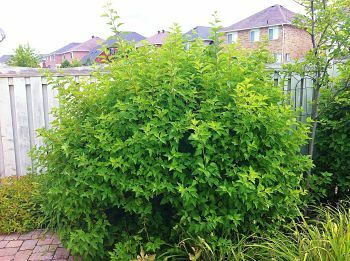 Read on to learn more about the unique features of each shrub! Even if your shrub is male and doesn’t produce berries, there are still many other features to enjoy. Bayberry shrubs provide year-round shelter for small animals, and their leaves – as well as the berries – are aromatic, particularly when crushed. The bayberry is a semi-evergreen shrub, meaning that though its fall colour is minimal, most of its leaves stay on throughout the winter. Leaves may turn a rusty orange to brown in the fall, providing a contrast to the green, white, and brown backdrop you would normally see in winter. Bayberries do well in sand, loam, or light clay soils - just not heavy, dense clay. They can grow in either full sun or part sun conditions. Second on our list, black chokeberry has an average height and spread of five feet each at maturity – so, it’s a great shrub to use when creating your own backyard haven! The flowers have five white petals arranged around pink centres, and bloom in clusters in the spring. Black chokeberry fruits are edible, though they are tart when raw. They can also be made into jellies, jams, or pies. The berries have high levels of vitamin C and antioxidants and are great for songbirds as well as humans. Berries are pea-sized, dark bluish-black in colour, and mature in late summer or early fall. The black chokeberry showcases beautiful autumn colours, with its leaves turning from orange to red to purple in the fall. It grows well in all soil types, and also tolerates wet conditions – which is great if you have a poorly-drained spot in your yard that you want to fill! Yards lit with full or part sun provide great growing conditions for this shrub. 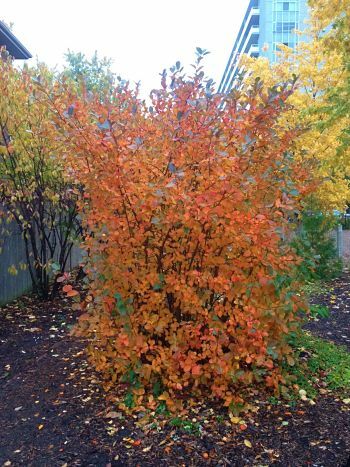 Apart from the privacy and fruit it provides, the black chokeberry is a very vibrant shrub in the fall! The common ninebark reaches average heights and spreads of six feet each at maturity, making it another good option for providing privacy. One of the ninebark’s characteristic features is its interesting bark: it starts out shiny, smooth, and reddish-brown, and develops exfoliating strips as it matures. Mature bark is brown, with reddish-brown inner bark revealed where the outer bark has stripped away. Ninebark flowers bloom in late spring and are great sources of nectar for butterflies and native bees. They emerge as small, white blossoms with five petals each, grouped in dense, round clusters. Fruit – maturing as drooping clusters of inflated, papery, pinkish-red seed capsules – follows the flowers in early summer, sometimes persisting throughout the winter. The fruit is not edible for humans, but is greatly enjoyed by birds! Ninebark leaves turn a nice shade of yellow in the fall. One interesting fact about the common ninebark is that it is tolerant to juglone – meaning that if you have a black walnut tree nearby, it can still do well. Ninebark grows in all soil types (sand, loam, light clay, and dense clay), and tolerates full or part sun. The privacy provided by the common ninebark is well-illustrated here! Last in this bundle, the mature red osier dogwood shrub is an average of six feet tall and eight feet wide – perfect for privacy. Like the ninebark, this shrub’s bark changes with age – starting out greenish-yellow or reddish in colour, it evolves to become dark red or brown at maturity. This colour is a striking sight in any season but is particularly noteworthy during the winter. Red osier dogwood flowers bloom in early summer as small, white, flat-topped clusters. Later in the summer, the fruit arrives: groups of white berries mature at the ends of red stems, and though they’re not edible for humans, they attract many bird species like bluebirds, cardinals, and orioles. In the fall, red osier dogwood leaves turn orange to red to purple. Not only are red osier dogwood shrubs juglone-tolerant, but they also can grow in wet conditions – so, like the black chokeberry, they may be a great choice for a poorly-drained spot in your yard. As with the other shrubs in the bundle, red osier dogwood grows well in full or part sun. 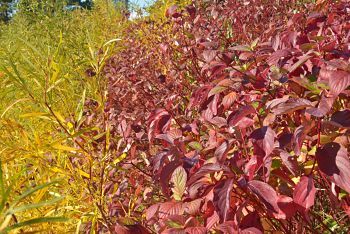 An expansive red osier dogwood shrub shows off its red leaves and stems in the fall. 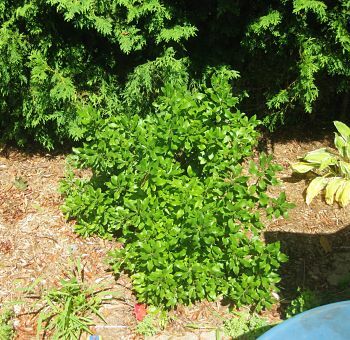 These four shrubs are a great way to increase privacy in yards with many different types of sun and soil conditions. Contact us to order yours today! The Privacy Shrub Bundle is available while quantities last. Species substitutions may apply, based on availability.